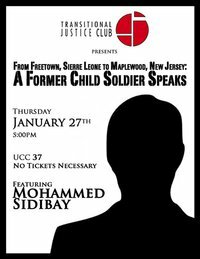 The Western Transitional Justice Club, along with the Centre for Transitional Justice and Post-Conflict Reconstruction, are proud to present Mohammed Sidibay, a former child soldier from Sierra Leone, who has agreed to speak at Western about his past experiences and hopes for the future. This is a free event and tickets are not necessary. Please come and show your support on Thursday, January 27th at 5pm in UCC 37.